Even if you take the utmost care with your headphones, it's unlikely that they'll last longer than a few years; technology moves on, parts degrade, and what was fashionable a few years ago, becomes wildly uncool with alarming rapidity. That's something Swiss-British design company Luzli hope to change with the Roller MK02 headphones. Designed to "last a lifetime", these luxury Swiss-watch inspired cans are now available to buy for an eye-watering $4,000 / £3,840 (around AU$5,600). But can headphones really last that long? When we spoke to the design duo behind Luzli, Dina Guth and Andrew Lee, Lee was confident that the Roller MK02's are hardy enough to "last a generation", saying the headphones are like "a traditional self winding analog watch compared to a digital smart watch", which only have a lifetime of "a few years". How can Luzli be so confident of the Roller MK02s' longevity? Lee told us that it's all down to the company's use of long-wearing materials like pure aluminum and stainless steel, and "traditional" audio technology when creating the Roller MK02s. The technology is "the same as headphones from 100 years ago... they're a bit quirky and a bit strange, but the quality is still there" Lee said, describing how the MK02's customer 40mm drivers were developed to create "the finest possible sound". 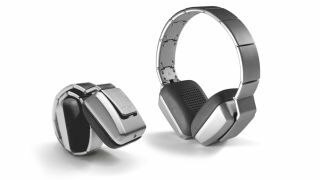 That means you won't find modern trappings like active noise cancelation, wireless connectivity, or inbuilt microphones here – these are headphones reduced to their purest form. What if they break? Lee says that he and Guth designed the MK02s so that "everything is replaceable – there's nothing you can't get a new part for or repair". Like Luzli's first pair of headphones, the Roller MK01s, these cans are designed for listening on the go, rolling up small enough to fit comfortably in your pocket thanks to a linked headband – not unlike the links on a watch. As you may expect for that high price, the MK02s come with some luxury accessories, including a suede travel bag and a wooden display case. They're also fairly exclusive. Lee told us that Luzli plans to make only 100 pairs, and that they are made to order. Whether that justifies the high price really depends on how much you value the exclusivity of your audio gadgets – and whether the Roller MK02s really will last a lifetime. Of course, only time will tell.